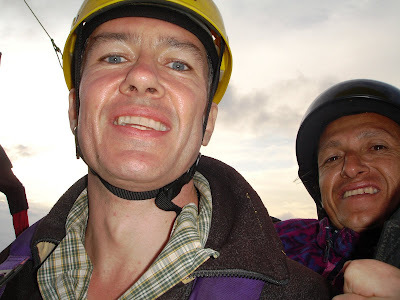 Following his inner adrenaline junkie, Russell Maddicks overcame his fear of heights to fly high in the Venezuelan Andes with paragliding pioneer Jose Albarran of Fanny Tours. After all the macho chat on the drive up the mountain, it was a sobering moment when I finally stepped into the harness and peered over the edge to the broiling waters of the Chama River in the valley far below. The jump off point at Tierra Negra is at 1,500 metres above sea level, and I was now faced with the prospect of a 900-metre descent to the village of Las Gonzalez. In a few minutes, I thought with a sinking feeling, I shall have to step off this mountain with only a flimsy length of brightly-coloured fabric tied to my waist to stop me plunging onto the jagged rocks of the Chama Valley. Somehow, risking my life for a "cool experience" didn't seem like such a good idea. But I wouldn't be alone, thank god, I would be flying tandem, meaning a qualified paraglider would be taking me up and hopefully down in one piece. It was a good idea to go tandem. Given the force of the wind up at Tierra Negra, If I jumped off this mountain on my own I'd probably be blown all the way to Brazil. It had all started down in the Andean city of Merida, Venezuela's most popular tourist destination and a rapidly growing centre for adventure sports. 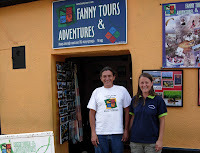 Passing by Fanny Tours I bumped into Jose Albarran, something of a local legend for his exploits as a mountaineer and a pioneer of paragliding, which is known here as "parapente". Jose's wife Patrizia, a sweet Swiss lady from Lugano, was quick to assure me that Fanny Tours had nothing to do with naughty nights on the town but was in fact the name of the previous owner, a name they were now stuck with. "At least it gets us noticed," she said. Patrizia met Jose years ago, when he took her on a tandem flight that led to love. They now run one of the best adventure businesses in Merida, offering climbing tours to the highest local peaks, mountain biking through high mountain villages, canyoning, white-water rafting and, of course, paragliding. Jose is better known to his friends as "Piojo" ("Flea") - a nickname he earned for his exploits on some of the hardest rock climbs in South America, the USA and Canada. I had heard great things about him from some extreme-sports fanatics I knew in Caracas, which gave me confidence in his abilities, although they'd also used the word "loquito" quite a lot when describing him. A tall, thin guy with a ponytail and a winning smile, Jose was keen to show me the local paragliding scene, especially Las Gonzalez, which he called "el pueblo de los voladores" ("the town of the flyers"). I had flown tandem before with another pioneer of the sport called David Castillejo, better known as "El Cafe" - they all have nicknames in Venezuela. 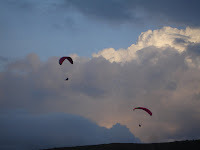 The first time I had flown tandem was on a ridge above El Hatillo, near Caracas, and the second time was in Placivel, a legendary hangliding spot on the road from Colonia Tovar down to La Victoria. But I had only flown from relatively low hills and for short distances, just 15 minutes or so in the air. Merida is a completely different prospect. Surrounded by jagged Andean peaks and wide glacial valleys, Merida offers paragliders strong winds and high-altitude launch sites. And that means much longer flights, more pirouettes in the air and plenty of spectacular scenery seen from above - if you can bear to look down. It also meant I would have to overcome my irrational fear of heights and the jelly-legs response that usually accompanies it. 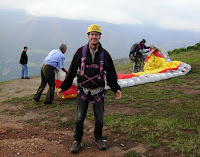 "It's the closest you'll ever get to flying like a condor," Jose said, sensing my trepidation. "I've never lost a tourist yet," he added with a big smile. And that was that. I mean, who doesn't want to soar like a condor over the Andes? Up at Tierra Negra, the gusts of wind were strong enough to blow my hat off when we first arrived and it was about 20 nail-biting minutes before Jose felt the wind had calmed down enough for us to take off. Then suddenly, it was all go. Jose called me over and strapped my harness to his. Then, before I could say "No Way, Jose!" the parachute opened above us as if by magic and with a whoosh we were up, up and away, my feet gliding over hundreds of metres of nothing but air. Flying tandem is an incredibly exhilarating experience. Once I had settled back into the seat tied to my harness all I had to do was "relax" and enjoy the ride. Using the air currents gushing up the valley, Jose flew us parrallel to the ridge, back and forth in slow swoops that gave us plenty of time to take in the scenery. The views of the mountains were spectacular and we could see the city of Merida spread over its flat plateau like an elaborate arrangement on a rectangular wedding cake. But the best bit was seeing other paragliders gracefully soaring above and below us, although it was hard to imagine that we were doing the same thing. The only sound was the wind in my ears as we did the turns. I have to admit, I had a few white knuckle moments as we shifted our weight to turn and the parachute seemed to give a little, but Jose was great and made it all seem easy. That said, after 45 minutes in the air all I wanted was to get my feet back on solid ground. I also wanted a drink of something strong that would warm me up, get the circulation going and put some strength back into my wobbly legs. Luckily, Jose's friend in Las Gonzalez makes his own chuchuguaza - the strongest cane-alcohol homebrew I've ever tried. To be honest, I could have done with some chuchuguaza before I put on the harness and jumped off the side of the mountain but a few shots of throat-burning jungle juice certainly hit the spot when I did get down. The landing was as unexpected as the takeoff. As we circled down towards the valley floor Jose told me to slip out of my seat and get ready to run, but in the end he simply pulled the chords tight, the parachute opened and closed and we landed softly in a heap on the ground. All in all, it had been an unforgettable experience and I had overcome my fear of heights, albeit temporarily, thanks to Jose. Adenaline junkie? Eat your heart out Jack Osbourne.